Welcome to IFEX 2018 with the theme “The Essence of Infinite Innovation”. 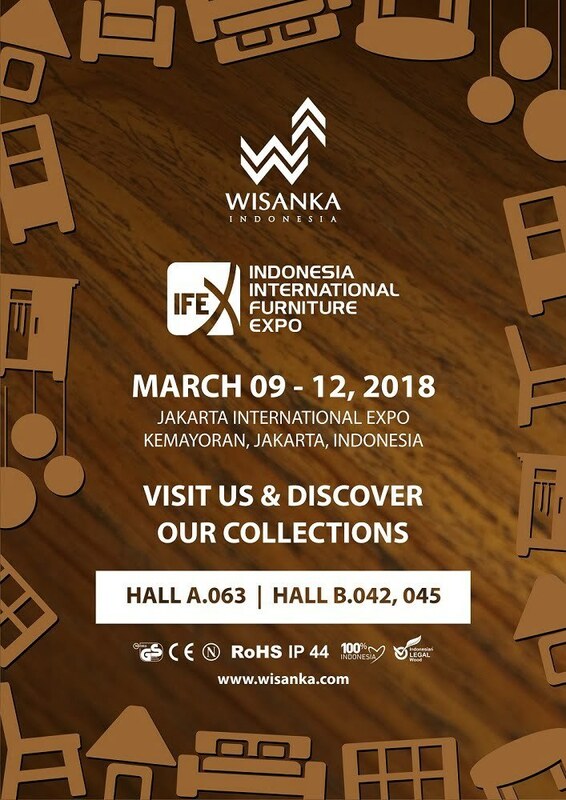 The event will feature Indonesia’s Best Export Furniture products, which will be held in March 9 – 12 2018 with locations at the Jakarta International Expo, Kemayoran, Jakarta. Now IFEX 2018 is considered as one of the furniture & handicraft events to be attended in Asia as this is part or Asia Furniture Show the life circle in March every year. Last year’s event was attended by 454 exhibitors and attracted 11,225 buyers from 111 countries making it one of the Southeast Asian furniture fairs in the March issue. Wisanka, as one of the leading furniture manufacturers in Indonesia will participate in this event. Therefore we invite you to visit Wisanka booth at Hall A.063 | Hall B.042 | B.045. We display the Newest and best selling furniture from Indonesia Contemporary and Modern Furniture, Indonesian Indoor furniture, Indonesia Outdoor Furniture, Mahogany Furniture, Rattan Furniture, Classic Furniture, Decorative Lamps, Handicrafts, Furniture Projects, Furniture Factory, Indonesia’s largest and best selling Indonesian Furniture Supplier. Please contact us for more information about IFEX 2018. Thank you very much and see you there!